Hello, we are Mark and Debbie van Blommestein from Kent, UK. We’re leaving the UK on 5th November 2017, taking a cargo boat run by Grimaldi Line from Tilbury to Montevideo, Uruguay. The route includes stops at Hamburg (Germany), Vitoria (Spain), Rio de Janeiro (Brazil), Santos (Brazil), Zarate (Argentina), and finally Montevideo. This journey takes just over 3 weeks during which time we plan to perfect our Spanish, plan some sort of route, and relax on deck. After approaching 40 years with the NHS I have retired, having worked as a nurse in London, a midwife in Thanet and Deal, and latterly as a Stop Smoking Adviser for Kent Community Foundation Trust, and am looking forward to having time out before deciding what to do when we return next year. 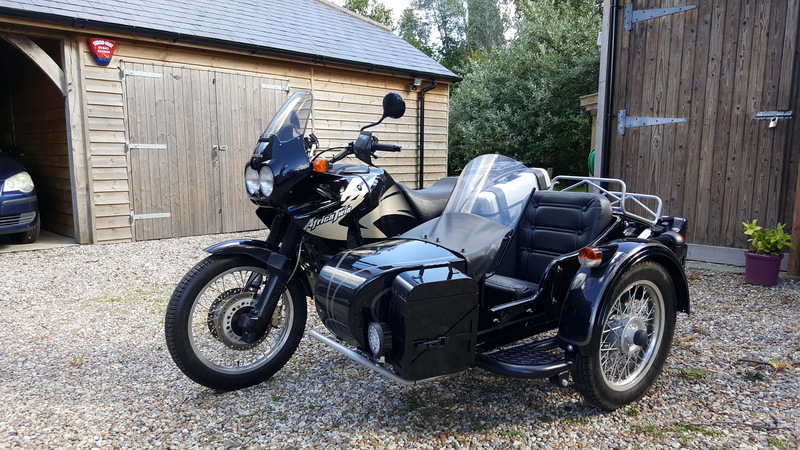 I passed my bike test 13 years ago but felt this trip would be easier with one vehicle and the sidecar option seemed a perfect way to go. I had my first bike was when I was 16 years old and they have been a huge part of my life since then. I’ve always wanted to do a trip like this since I first read ‘Jupiters Travels’ by Ted Simon when I was a teenager, so I’m taking time out from work as a Chartered Surveyor in Kent and leaving the running of the business in the capable hands of my partner, Stuart, till our return.